Perhaps it will work. 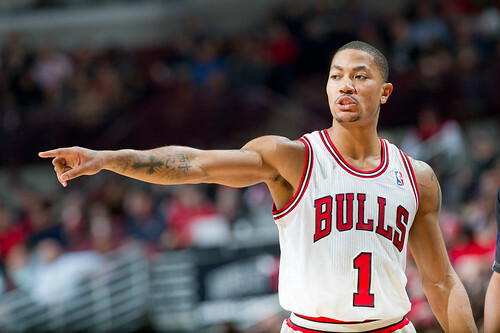 After all, the Bulls might have the NBA’s best combination of overall team depth and interior defensive strength. So maybe in this unusual season of 66 games in 124 days, they can endure longer. 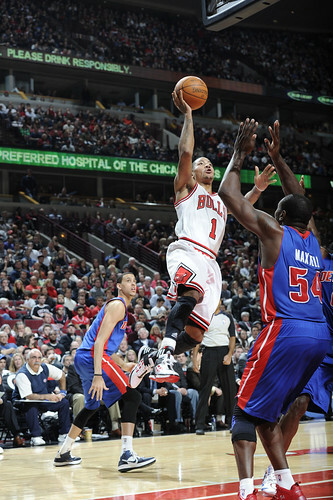 So far, it’s been remarkably effective with Monday’s 92-68 victory over the Detroit Pistons. The Bulls are 8-2 and in their three home games combined, according to Elias Sports, they set a new NBA record in the shot clock era since 1954 of giving up just 206 points. It’s a testament to their relentless defensive attention to detail and effort. There are injuries now with Richard Hamilton still out with a sore groin, which is worrisome because the Bulls still don’t know when he will play and if that injury lingers the offense has taken a step back from last season. C.J. 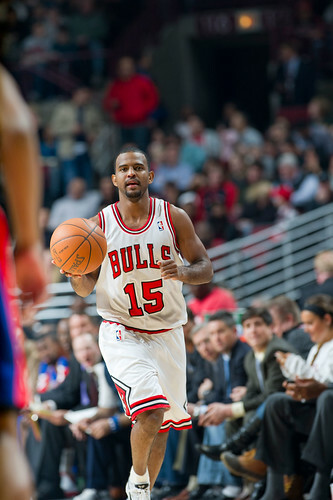 Watson is out with his elbow injury, but could be improving more quickly with the play of John Lucas III, who had six points in 15 minutes and again was on the floor in key times when the Bulls surged ahead. But it’s a curiosity what has become of Joakim Noah, who didn’t even attempt a shot in 25 minutes Monday and had four points. 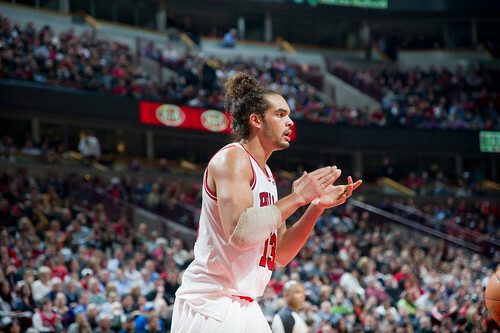 Noah is now averaging 7.3 points and 3.0 for the last three games and shooting 38 percent on the season. That seems almost impossible for a seven footer who is at the basket. Also, generally steady Luol Deng had four points on two of 12 shooting and has scored in single figures in three of the last four games. He is shooting 41.2 percent, a career low for a player who also makes many of his points at the rim. This, of course, raises the question of fatigue in the busy early season, though with blowouts both ways the last two games Deng and Rose have been getting plenty of time off. Noah has been getting plenty of fourth quarter time off, but more for reasons of ineffectiveness. 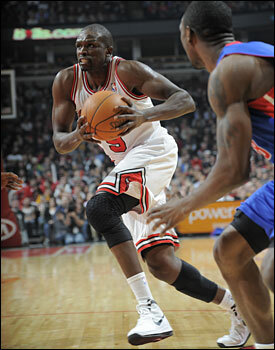 There’s probably no need to be given as steady a pro as Deng has proven to be. But he does appear now to have a legitimate backup in rookie Jimmy Butler, who has been impressive in his little time playing and teammates say particularly impressive in the rare team practices. Thibodeau has been positive about Butler, but, as usual, cautious with taking time away from his regulars. 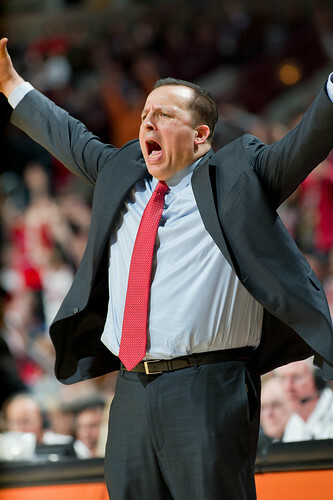 Actually, Thibodeau has done a subtle job of making changes. He is a player’s coach in the sense he’s not going to hold a player up to ridicule, not throw him under the bus, so to speak in the popular cliché. Though I suppose with this era’s players it should be about throwing him under the Mercedes. So he’s not about to change the starting lineup or even the rotation. But as they haven’t produced, Boozer and Noah have spent considerably more time on the bench in the fourth quarter, and again Monday Thibodeau went with Asik most of the more important times in the fourth. 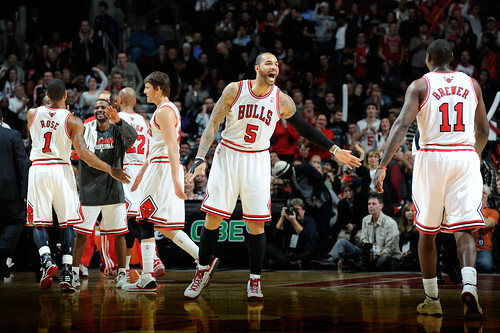 Boozer, as I mentioned, was really good. He shot the ball with confidence, though making them does make it appear more certain. But he also hustled more. Monroe probably is the best player on a horrible Pistons team now and led them with 14 points and 10 rebounds. Boozer did a nice job fronting him at times and denying entry passes, which he often doesn’t do and allows his man to get deep position. He didn’t this time. 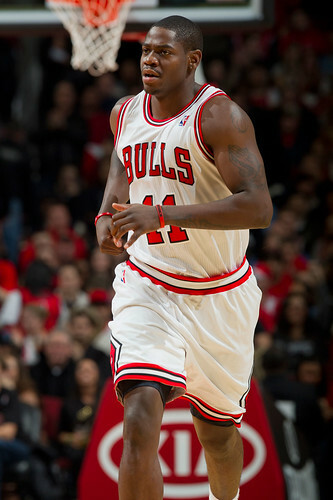 He didn’t have a turnover, blocked a shot and made a couple of nice passes working with Ronnie Brewer for scores. Brewer also shot well and had 12 points, but he’s not likely the team’s answer to offensive issues. It did for Monday against an awful Pistons team now 2-7 with an average margin of defeat of 22 points the last four games. The Pistons talked afterward of how well things went through three quarters when they were behind 68-59 and played the Bulls even the first and third quarters. It’s unfortunate because those games with the Pistons were probably my favorites years back. I won’t say poor Ben Gordon as he’s very wealthy now, but seems in a perpetual basketball funk. 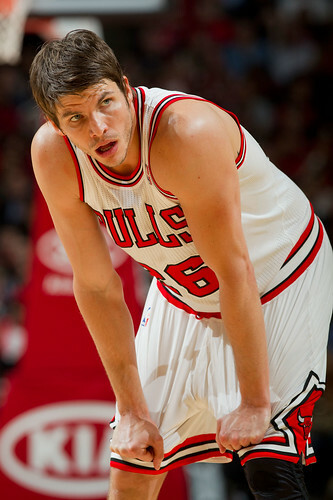 The Bulls did throw much of their defense at him as the Pistons have fewer scoring options than the Bulls. But Gordon had just 11 points, just two shots in the first half and is now 0-10 against the Bulls since signing with the Pistons. 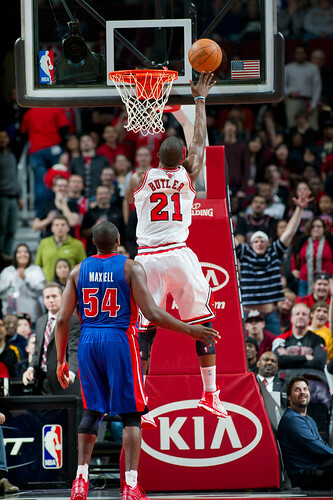 Jason Maxiell was one of 12, including twice throwing dunks off the back rim. The auto industry appears to be returning. You can’t say as much for the Pistons. Overall, it was a mostly tedious affair, almost jejune, if I must say so, though I always wanted a place to say that. There were a couple of nice Rose crossover highlights, one early as Rose left Brandon Knight seeing only daylight as he breezed by for a 12-4 lead. 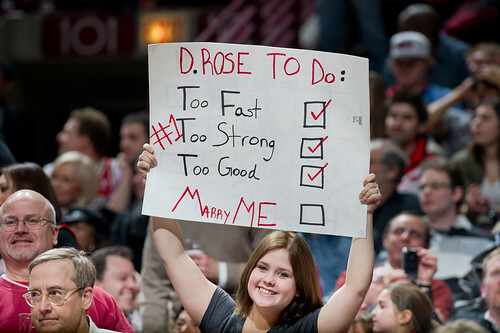 Rose followed with a three, though he would miss his next five such attempts and is now 27.7 percent on the season. Rose ran out on one of the few good outlet passes Noah threw and was fouled to make it 21-12, though the Pistons closed the first quarter with nine straight ending with a pair of Will Bynum jumpers to tie at 21-21. That lack of outlets also is a curiosity regarding Noah. Thibodeau did talk in general after the game about pushing the ball more even after made baskets. You can see Rose leaking out more to get to half court for a pass, though they rarely come quickly and he often has to retreat. 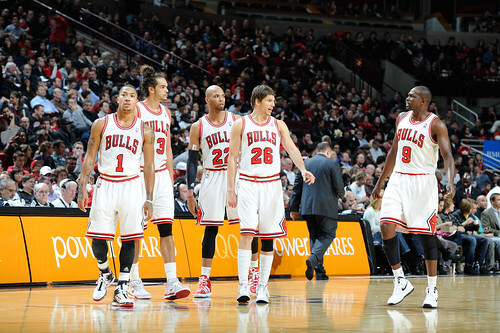 So the Bulls then walk into their offense, and with so little individual firepower, they need to play faster to score. The second quarter with the bench proved effective again as Kyle Korver continued his hot shooting making a pair of threes before he cooled off after halftime and Boozer both shot the ball well and made plays for Korver and Noah. 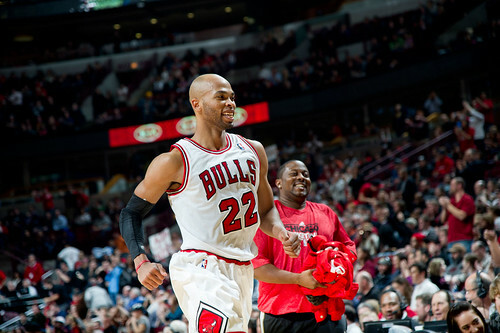 The Bulls did get a nice runout by Brewer after Noah’s block to make it 43-32 and closed the half ahead by nine behind Boozer’s 12 points. 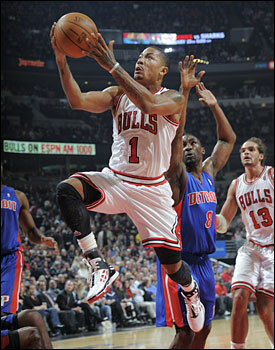 Rose had another nice blowby early in the third quarter leaving Monroe reaching to make it 53-41 and Boozer continued to knock in jumpers off pick and roll passes from Rose as the Pistons, like all opponents this season, have been targeting Rose and staying with the blitz after the screen more than ever. 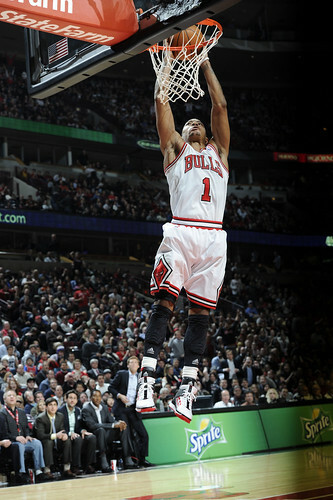 But Rose has been patient and passing the ball more becoming a solid playmaker. He still doesn’t see the floor like the truly great ones, but he is much better. 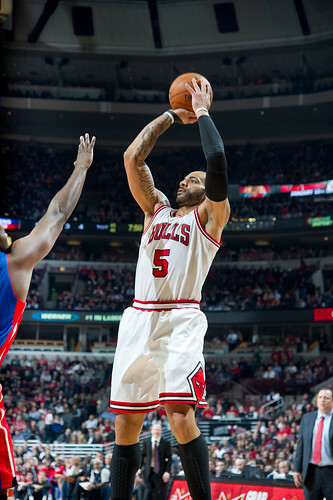 “He’s turning into one hell of a point guard,” said Boozer. “Last year, he’d take on the double and triple team and score most of the time to be frank. This year he’s doing a great job trusting us. He’s aggressive but playing incredibly smart as a point guard. He’s doing a great job getting everyone involved. Though the way things are going he may have to increase that scoring average, which is now at 19.7. Which is why Hamilton’s return is vital. Boozer in previous games has been getting some of the fourth quarter time off as well, but his replacement, Taj Gibson, is having an awful shooting season so far. He was two of seven Monday, mostly on jump shots before finally going to the basket late, and is shooting a career low 45.9 percent. Gordon did get it going a bit in the third with 11 points. But the Pistons absolutely collapsed in the fourth with a stretch with six turnovers in nine possessions, a few actually forced. They scored three points in the first eight and a half minutes of the fourth quarter and the Bulls couldn’t help but put the game away in pounding the inside for 14 free throws and making 10. The Pistons scored nine points in the fourth quarter. 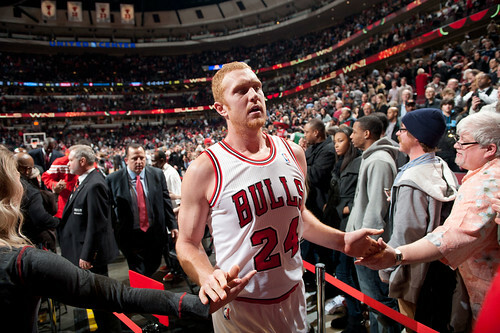 The Bulls might need to rediscover some offense first.